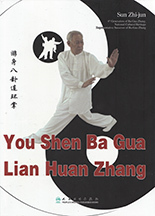 Sifu Su Yu Chang’s rare DVD performance and instruction of Liu Da Kai (Six Great Openings) Baji, detailing this important form, including applications with some atypical additions such as tie-ins to Chinese medicine, courtesy of Chang Sifu’s training as an acupuncturist. Sifu Sun Zhi Jun’s masterful compilation of his Swimming Body Bagua Zhang�it’s a book! it’s a DVD encompassing about 6 hours of training! it’s translated beautifully into English by Suzanne Robidoux. What more could you ask? Click each image to go to the page for more information and to purchase. Posted August 4, 2018 by Plum Staff. Comments and trackbacks are open. Follow the comments feed.